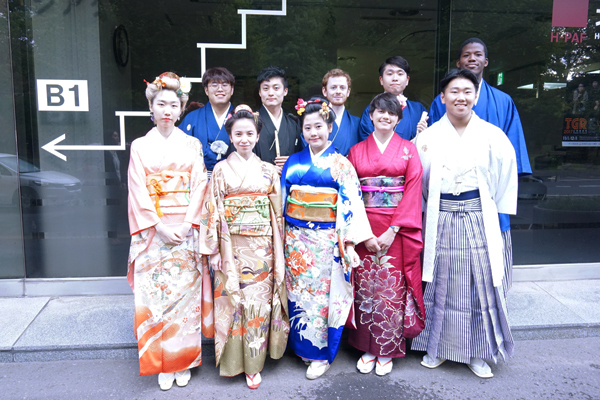 The exchange students had a chance to try wearing kimono on Tuesday, May 22. At first, they seemed slightly puzzled as they put on the unfamiliar clothes. 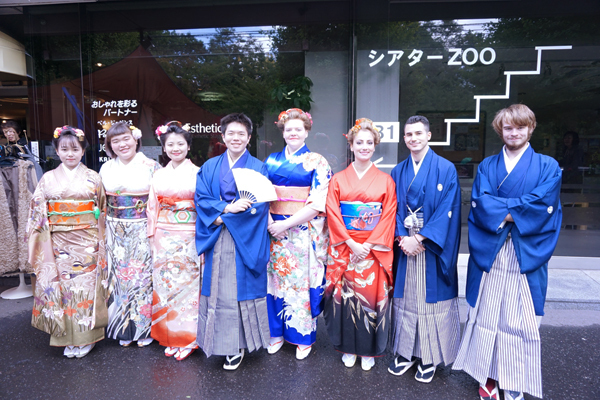 However, they were pleased to wear furisode (long-sleeve kimono for women) and hakama (Japanese traditional kimono for men). 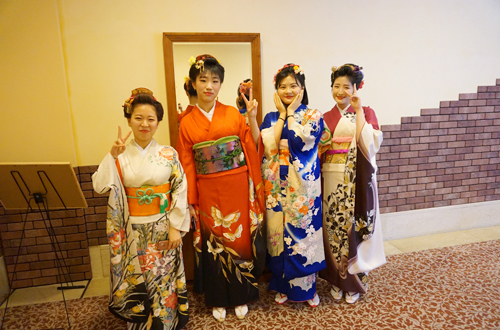 Afterwards, they enjoyed taking pictures of each other at the Japanese wedding ceremony hall in the hotel where the event was held. 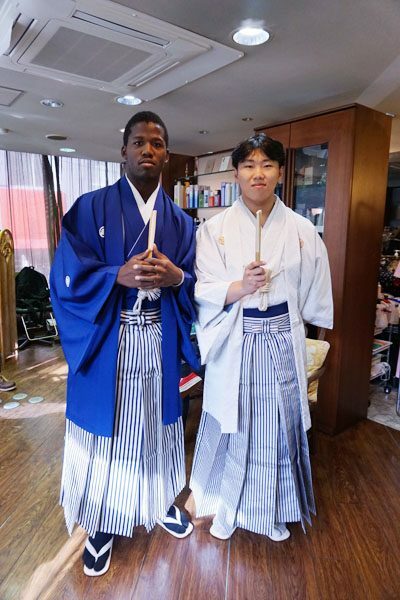 They had fun experiencing this aspect of traditional Japanese culture. 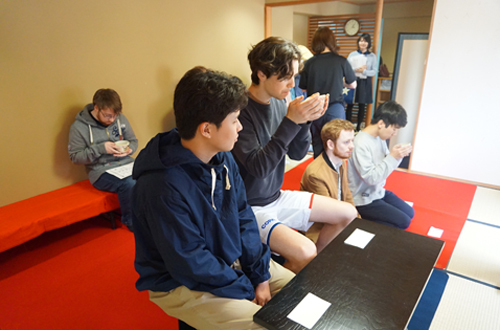 The exchange students were able to experience Japanese tea ceremony (Sado) with the cooperation of the Hokusei Tea Ceremony Club on Wednesday, May 23. 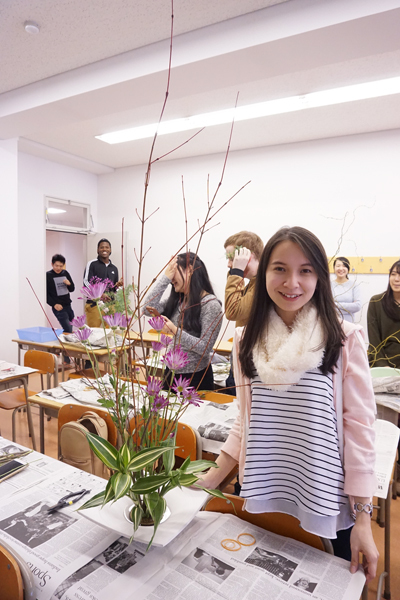 This was for the first experience to make traditional green tea for almost all of the exchange students. 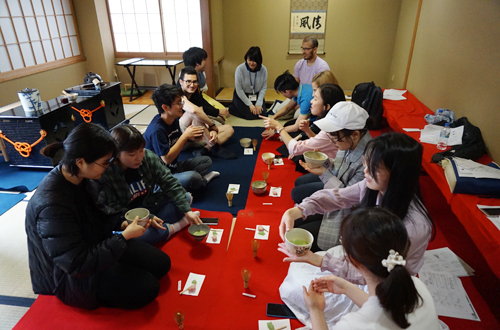 The students learned how to make tea with the instruction of a tea ceremony teacher, they also enjoyed eating Wagashi (a Japanese traditional sweet) with their traditional green tea. 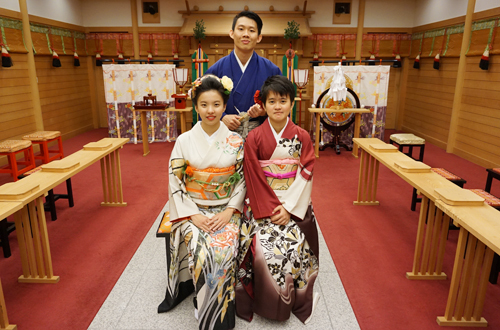 After the tea ceremony finished, they struggled with kneeling on the floor Japanese style, but they enjoyed experiencing this well-known part of Japanese culture. 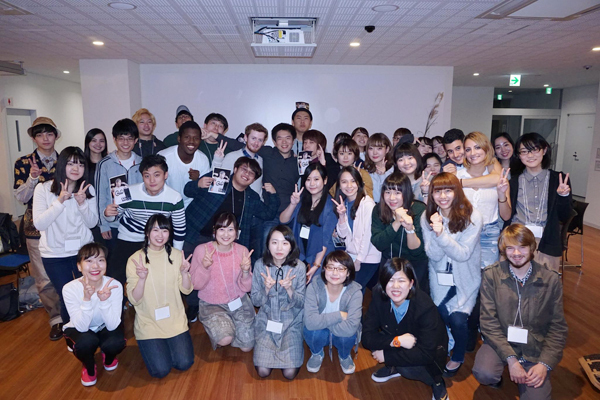 We held a two-day, one-night International Camp for Hokusei students and International students on May 19 to 20. 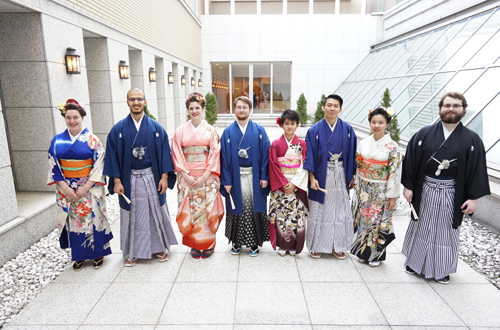 At the former Okazaki Noh Stage in Otaru, the participants experienced Noh (Japanese traditional performing arts) and learned Japanese culture. 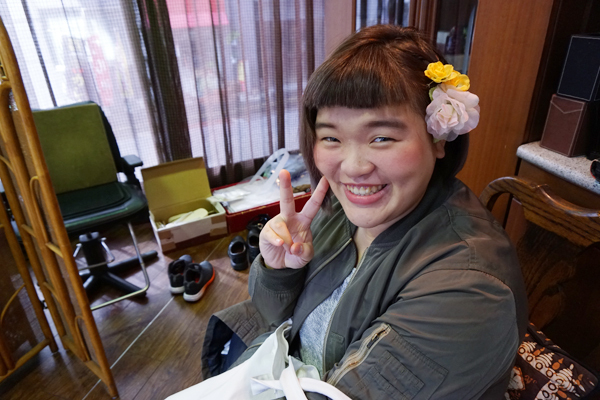 After that, they moved to a hotel in Niseko and had a pleasant evening interacting with each other. 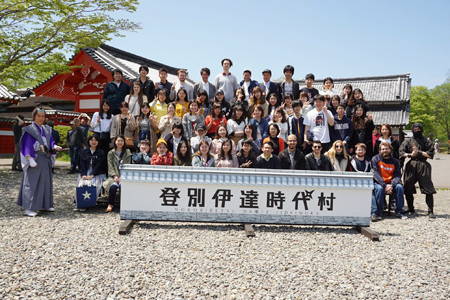 The next day, the participants went to Date Jidaimura, a historical theme park highlighting the Edo Period, and they enjoyed various activities there. 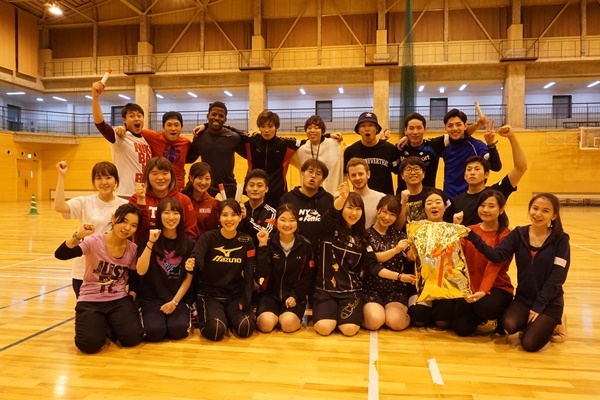 International Camp will be held again in the fall. 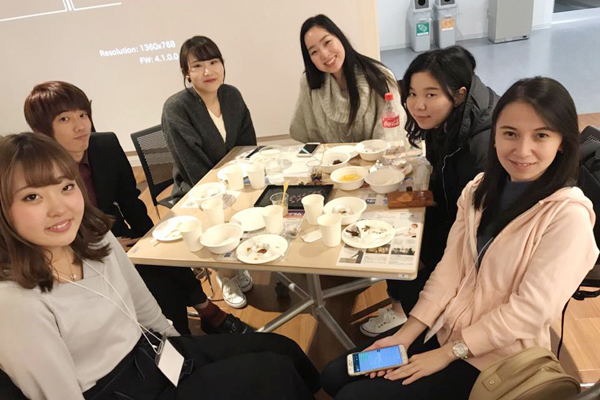 On Friday, December 8, HUIT (Hokusei University International Team) held a Farewell Party for the international students as their final event of this semester. 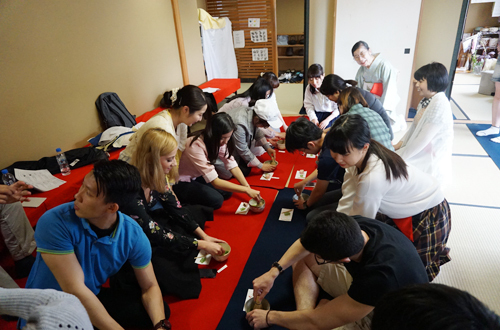 The party began with everyone playing the traditional Japanese New Year’s game of Fukuwarai. In Fukuwarai, blindfolded contestants attempt to pin facial features in the correct position on a paper face (similar to Pin the Tail on the Donkey). 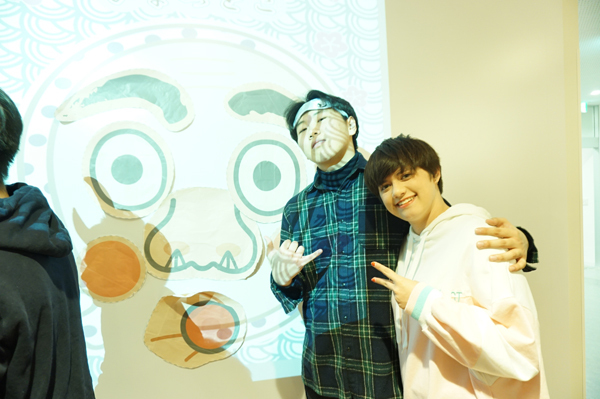 With the help of the audience, blindfolded students attempted to make the face of an okame (plump-faced woman) and a hyottoko (a clownish man). 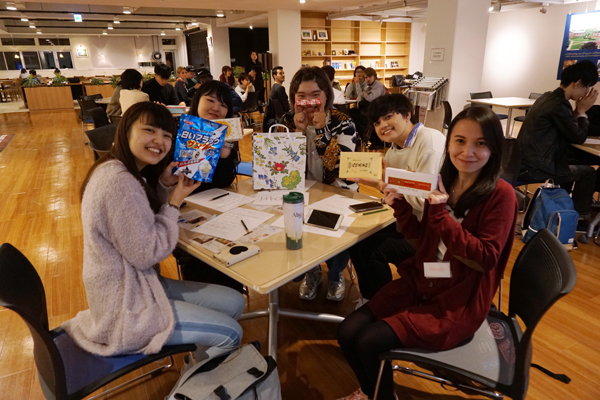 The next game was a True/False Quiz in which the students had to answer questions about Hokusei University and its International Exchange Program. There were twenty questions in all, which started out easy and gradually become more difficult. 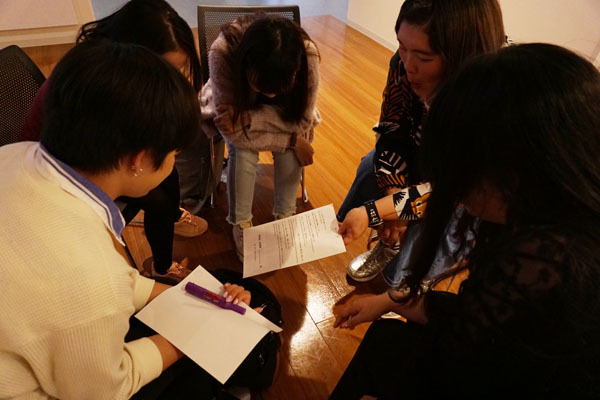 For the last few questions, the participants had to consult with each other in order to answer correctly. After the games came the main event of the party, a buffet meal. 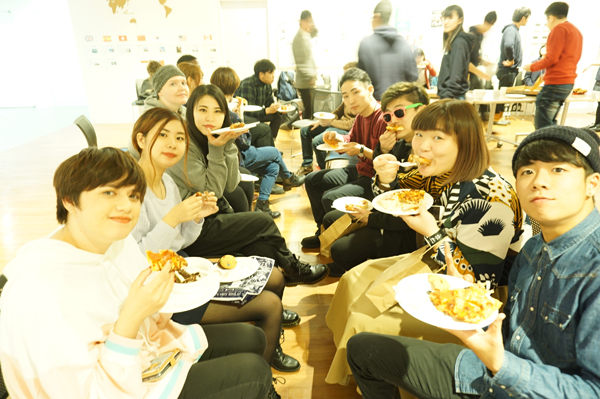 The international students and Hokusei students enjoyed eating and reminiscing about the past semester which they spent together. Everyone must have been hungry because they finished up all the food! 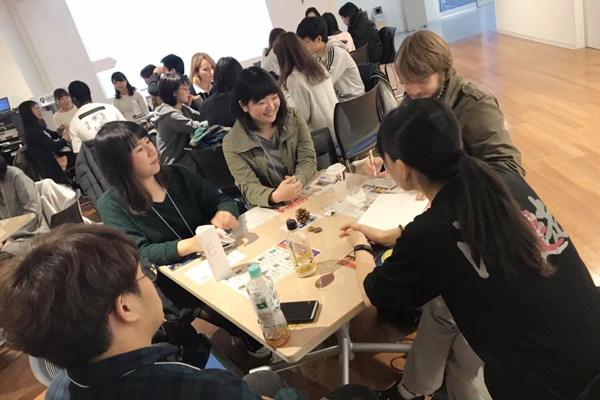 The party ended with everyone watching a movie make by the HUIT members, which showed many scenes of the international students from the beginning to the end of their stay at Hokusei. 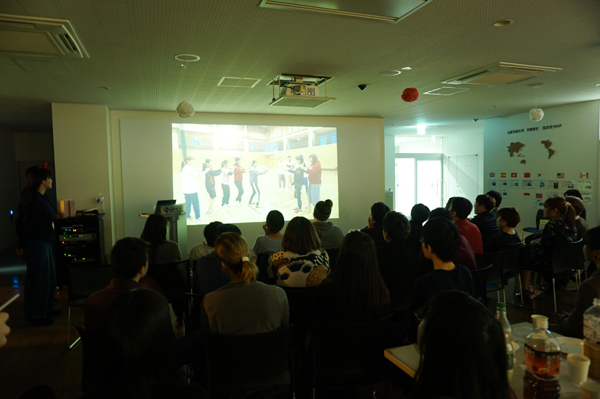 There was lots of laughter and many comments as the international students watched themselves on the screen and remembered all the things they had experienced in Japan. 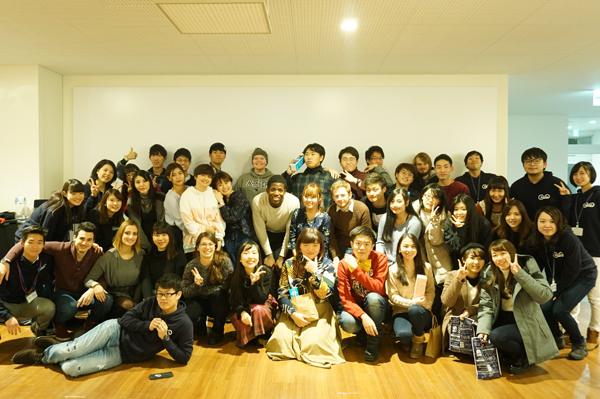 The members of HUIT would like to thank everyone who participated in this party and in the other events that were held with the international students during this semester. 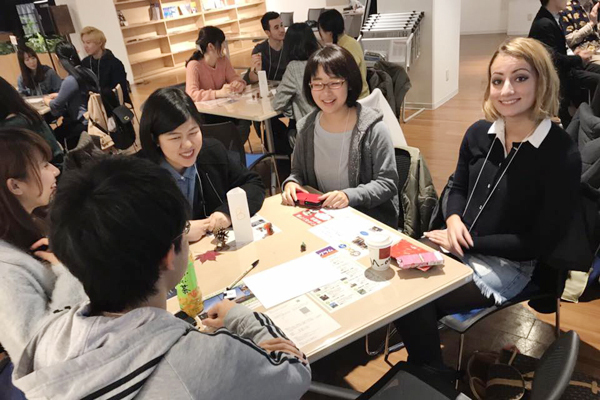 HUIT will continue to hold various international events in the future, and they look forward to meeting the international students who will study at Hokusei in 2018. 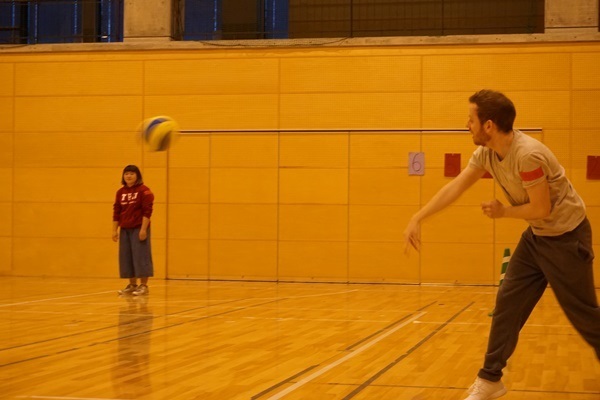 On Wednesday, November 15, an International Sports Match was held in the main arena of the Hokusei University gym. 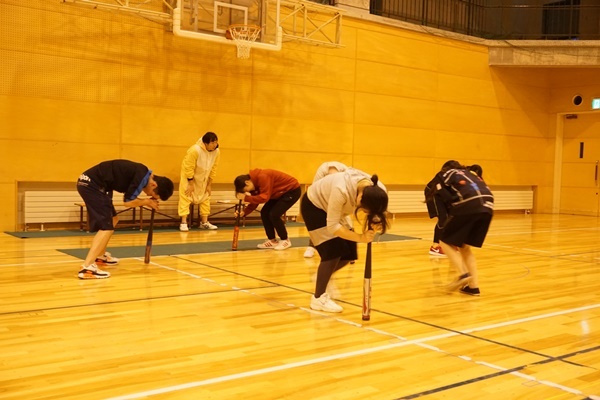 This event was organized by HUIT (Hokusei University International Team) to give Hokusei students and international students a chance to interact with each other through the common language of Sports, regardless of their native language. 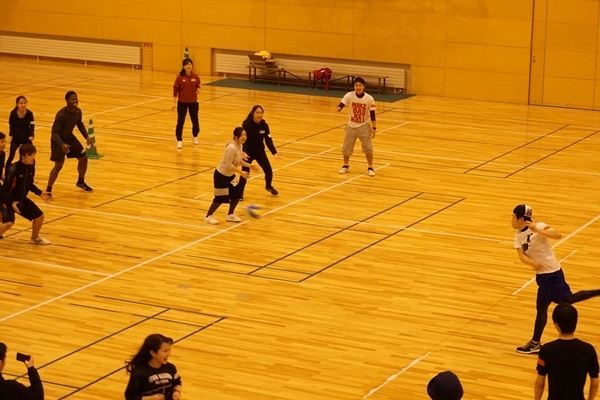 Three events, dodgeball, an obstacle course race, and a relay race, were held in this Sports Match. 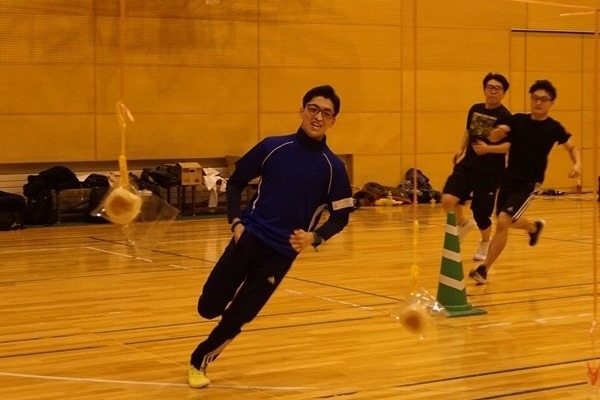 In typical Japanese fashion, all of the participants were divided into two teams—Red Team and White Team—for the competitions. 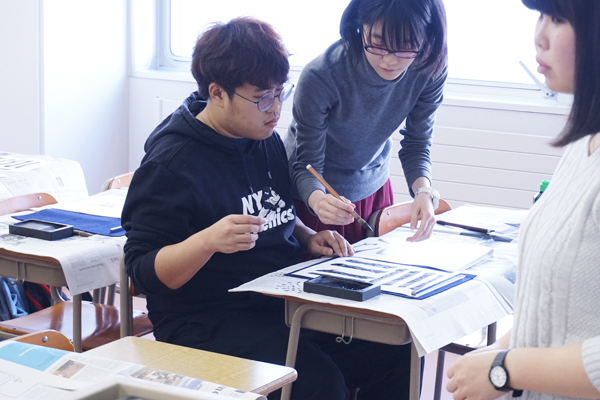 At first, it was somewhat difficult for the Hokusei Students and international students to talk; however, as the competition continued, they began to work and talk together quite enthusiastically. 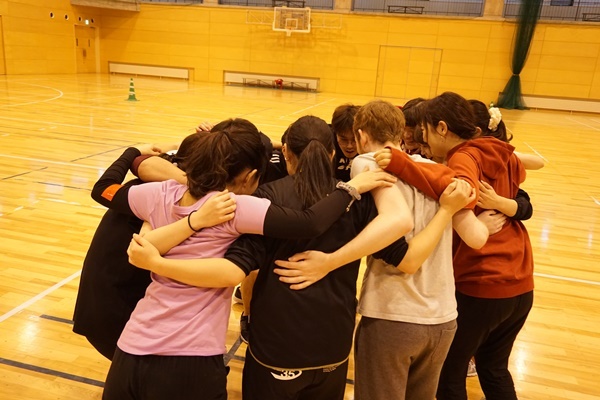 During the last event, the relay, the loud cheering by each team for their runners echoed throughout the gym, and the event ended successfully. 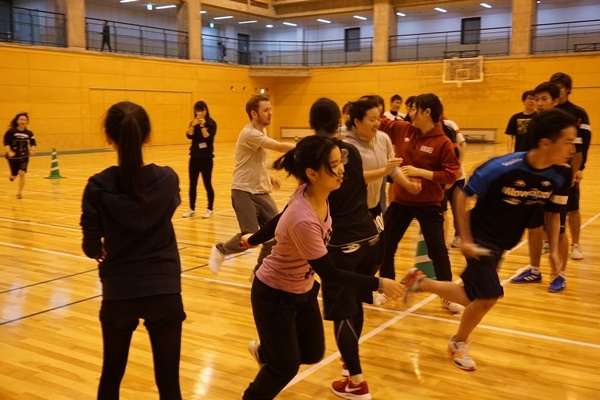 After all the points were counted, the White Team won, but regardless of the outcome, all the participants had a good time and got to know each other better, as Sports helped they overcome the language barriers. Thanks to everyone who participated. 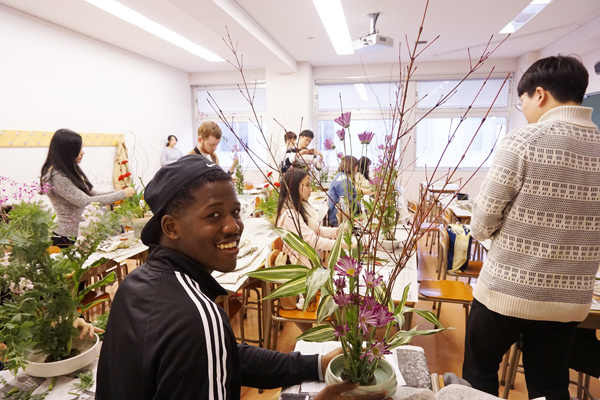 The international students had a chance to try their hand at kado (Japanese flower arrangement on Wednesday, November 1. 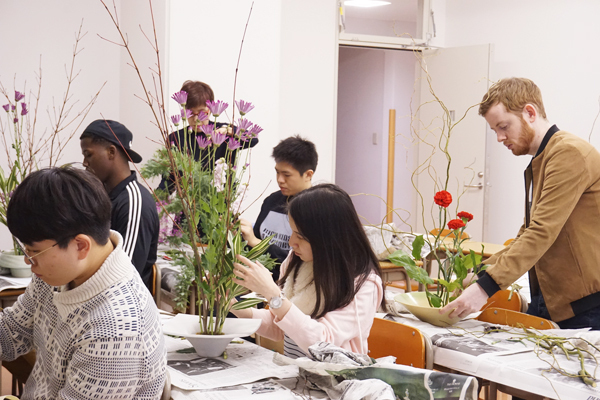 This event was held with the cooperation of the Hokusei Flower Arrangement Club. In kado, flowers and other plants are arranged by sticking them into the spikes of a kenzan (spiky frog). 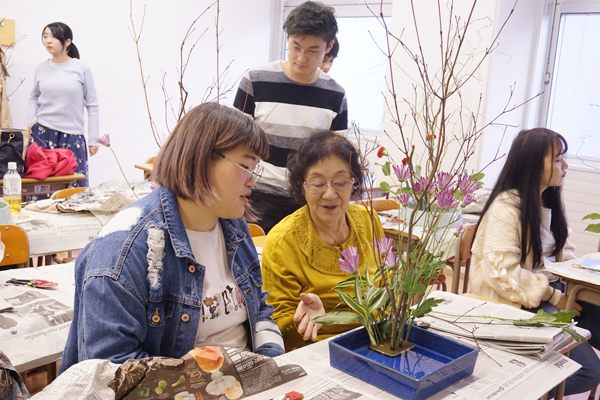 At first, the students found it hard to stick the flowers properly in the kenzan, but after many attempts and with the assistance of the Hokusei Flower Arrangement Club students and teacher they were able to arrange their flowers as they desired. 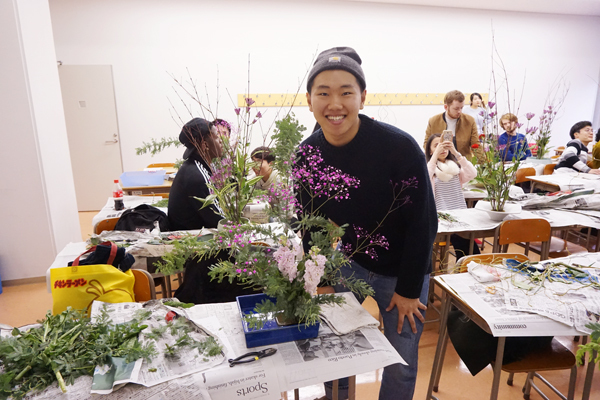 In the end, they created beautiful and unique flower arrangement which the teacher praised. 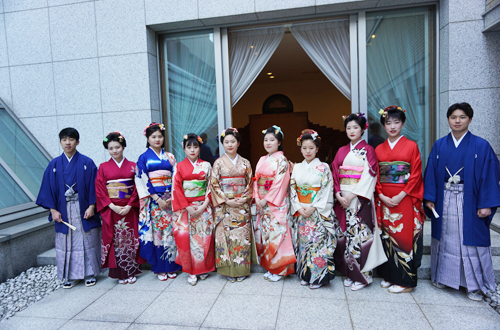 Promoting internationalization has been a goal of Hokusei Gakuen University since its establishment. 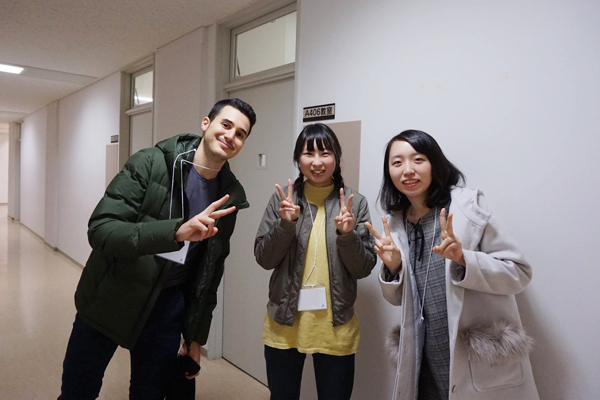 As part of this, the university has been working to provide a variety of international exchange programs and events in addition to formal academic classes that are taught in several languages. 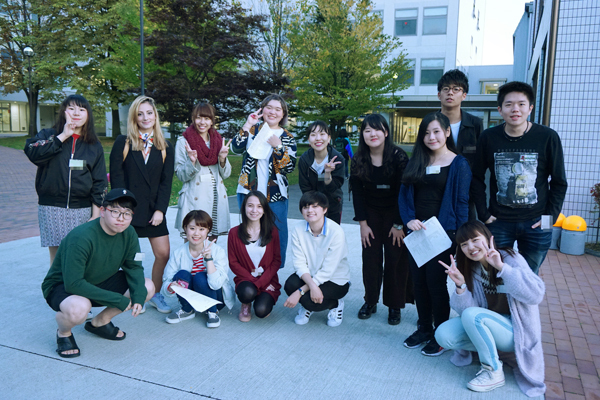 At present, there are 19 international students studying at Hokusei Gakuen University in the fall semester exchange program (16 students who arrived in September and three who are continuing from last semester). 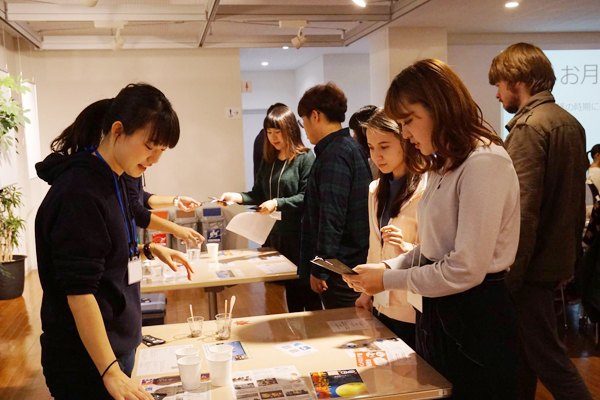 A calligraphy introductory lesson was held on Wednesday, October 18, as one of the various Japanese culture programs for the international students. 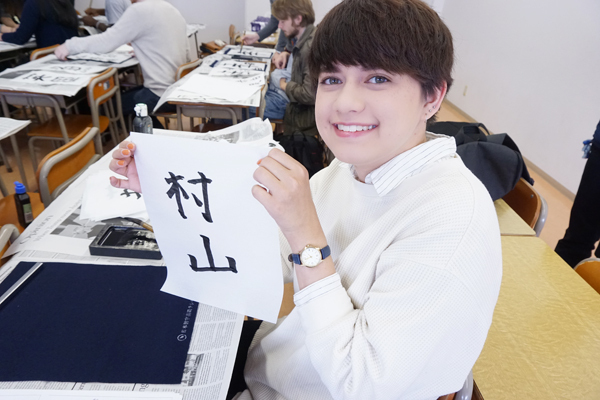 This was the first time for the international students to do Japanese calligraphy, so they began by learning how to use the tools, especially the special fude (brush). 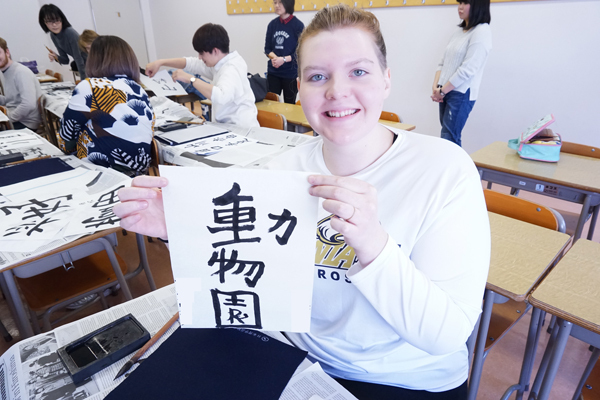 At first it was difficult for them to hold the brush correctly, but they learned with help from the Calligraphy Club members. After learning how to hold the fude, they moved to next step of learning how do draw lines and curves. 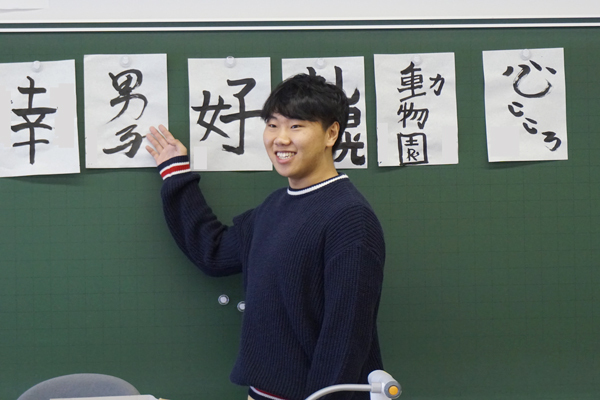 After that, they practiced writing actual kanji (Japanese characters) starting with easy ones like yama (山= mountain)and kawa (川= river). 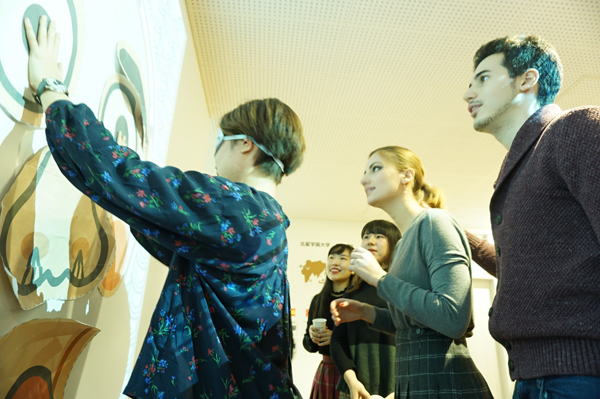 Finally, the international students displayed their works on the blackboard and introduced why they choose the word that they wrote. 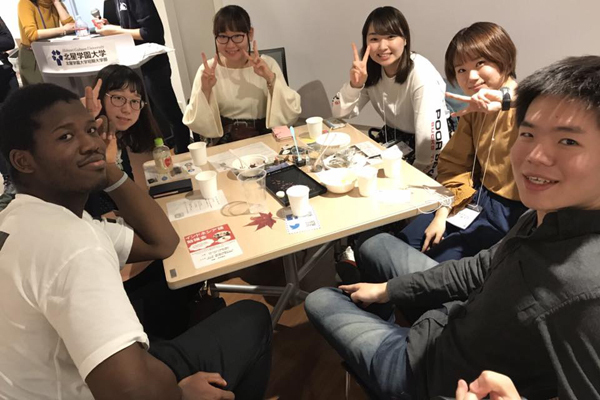 On October 20, HUIT (Hokusei University International Team) held a tsukimi (moon viewing) party in the International Lounge. 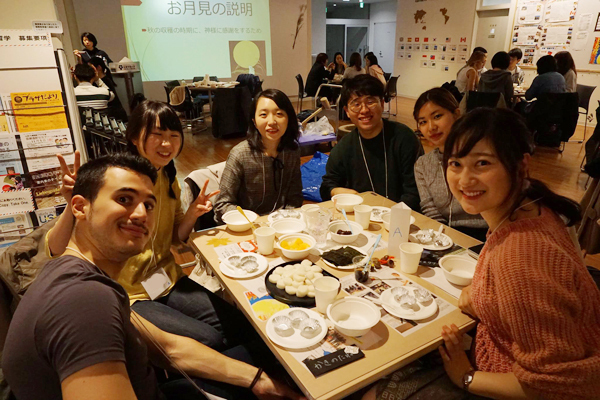 This tsukimi party was organized to give international students and Hokusei students an opportunity to experience Japanese tsukimi, a traditional autumn event in which people watch the full moon while enjoying mochi, Japanese rice cake. 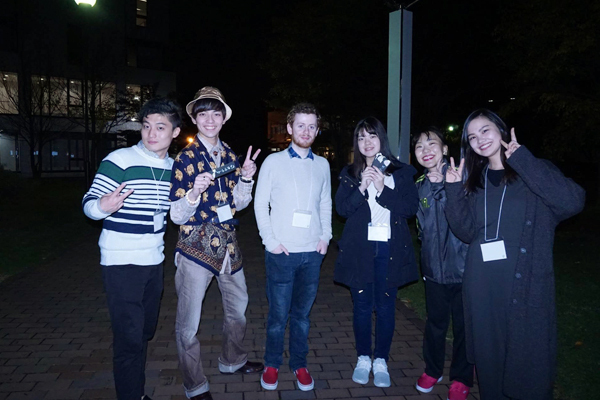 Unfortunately, the participants this year could not see the moon because of the cloudy weather. However, they were able to enjoy the mochi part of tsukimi. 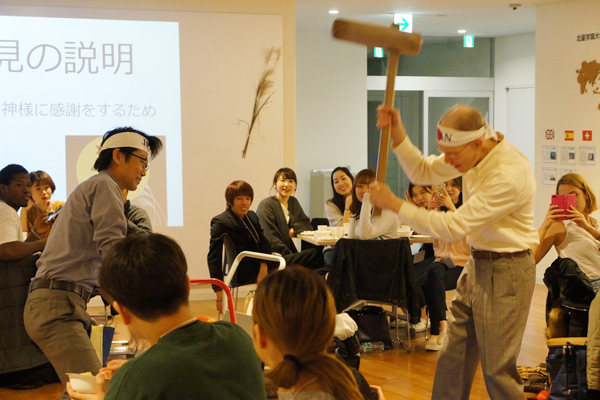 Using a large wooden usu (mortar) and kine (mallet) they did mochi-tsuki, which is the traditional method of making mochi by pounding steamed rice with a large wooden mallet to make soft, sticky, and very tasty rice cake. 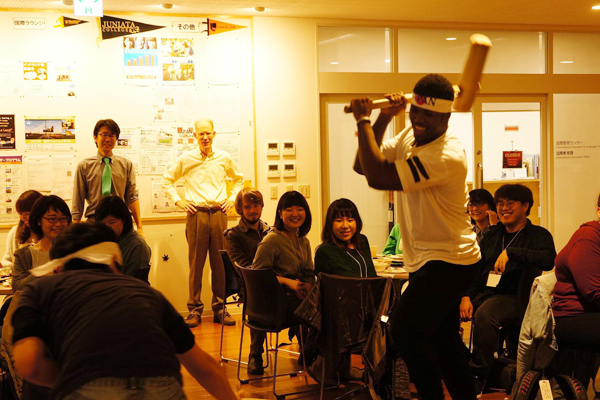 Everyone was excited as individuals took turns swinging the mallet to pound the rice while the onlookers shouted encouragement. 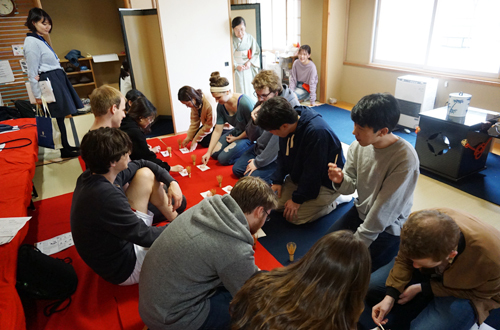 When the mochi was finished, everyone enjoyed eating this traditional Japanese treat. 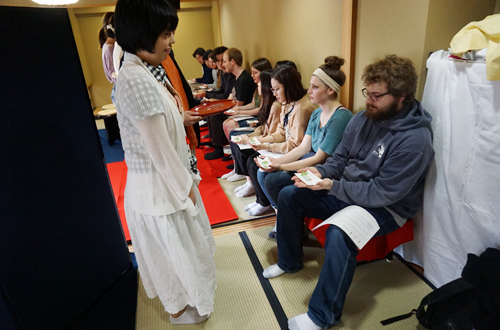 The international students will certainly remember their first time to do mochi-tsuki. 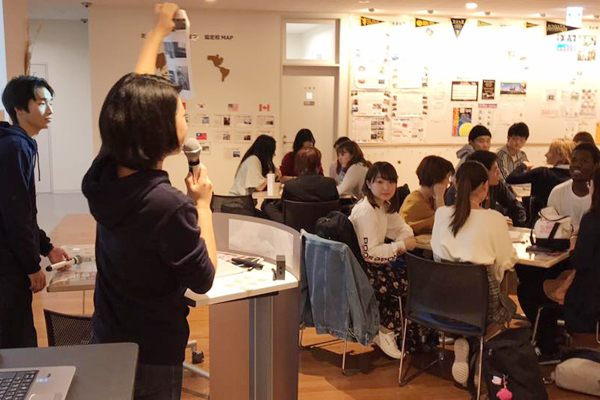 Hokusei Gakuen University holds several events, like this tsukimi party, throughout the year to encourage communication between Hokusei students and international students. Don’t miss the other events that will be held in the International Lounge! A photo scavenger hunt was held on Friday, September 29 at the International Lounge. 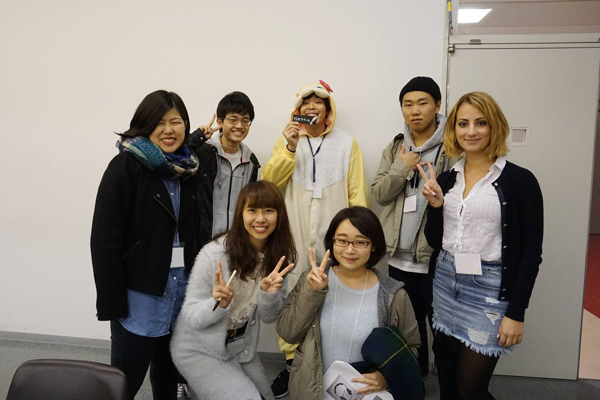 There were 30 students, including international students and Hokusei students, at this event. 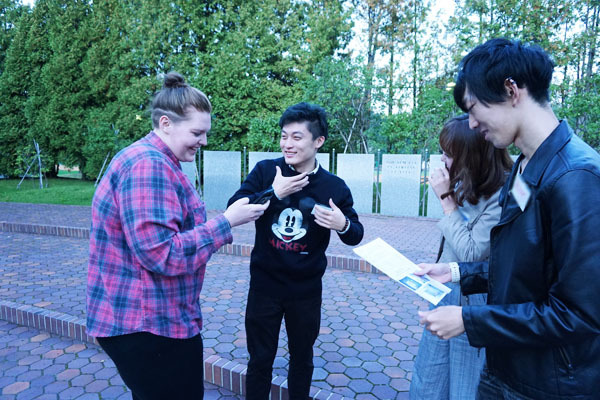 The participants had fun doing two kinds of ice-breakers before the photo scavenger hunt started. First, they played a game called “Name Catch” to remember everyone’s names. 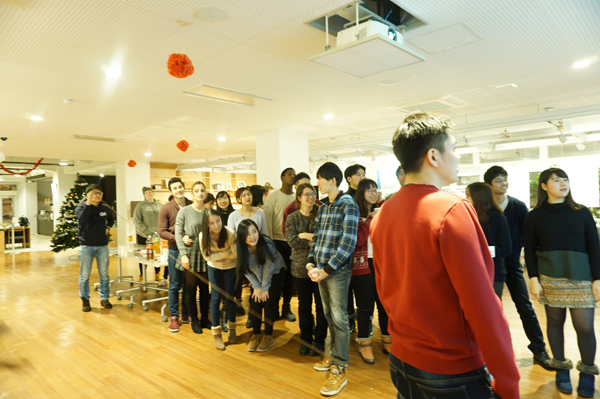 After that, the 30 participants counted off into groups of five and did two-minute self-introductions in small groups. Then the photo scavenger hunt started. 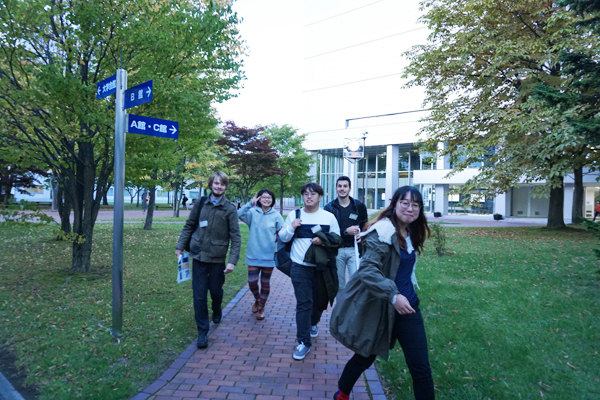 The students had to complete a variety of given missions by taking various pictures around the campus within a given amount of time. 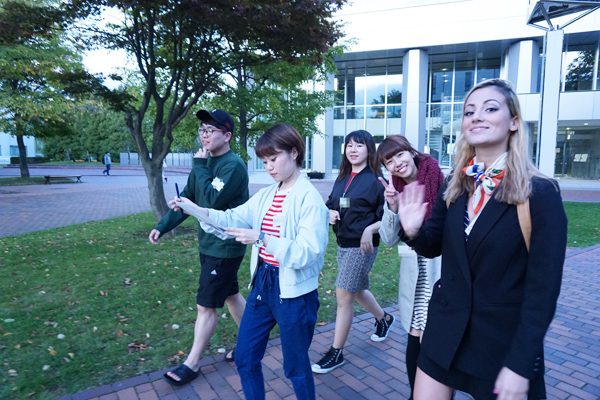 They quickly searched here and there around the campus within the designated time, with some groups making it back to the International Lounge just before time was up. The highest scoring team won the game, and they received a box of famous Hokkaido assorted sweets as their prize. 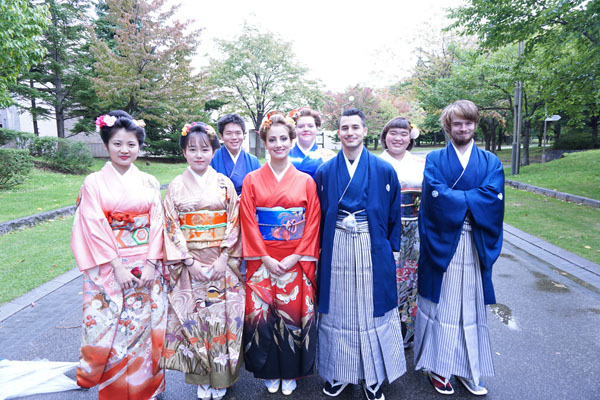 The exchange students had a chance to try on kimonos on Tuesday, October 3. At first, they seemed slightly puzzled as they put on the unfamiliar clothes. 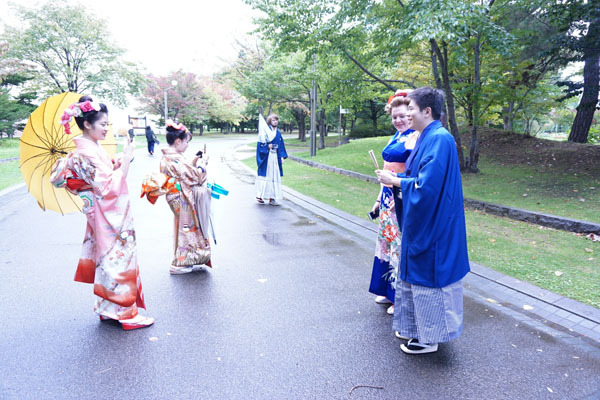 However, they were fascinated by kimono’s beauty and enjoyed taking pictures of each other. 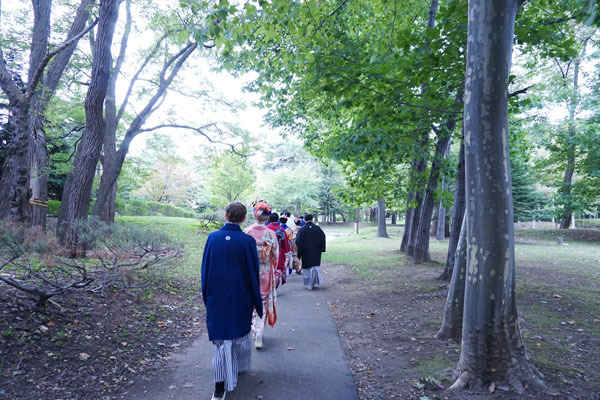 Afterwards, they took a walk to Nakajima Park. 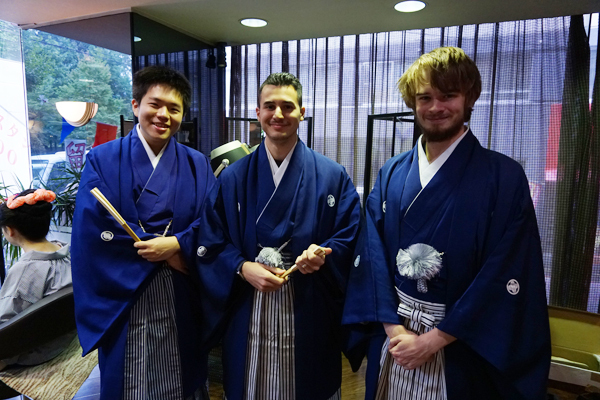 Although the weather did not cooperate, they had fun experiencing this aspect of traditional Japanese culture.